Petromax expands its portfolio of skillets for the open fire by high-quality Grill Fire Skillets made of cast iron. The ridged pan surface gives the meat not only the typical grilling pattern as if freshly taken from the grilling grate but also provides for low-fat and healthy roasting. Thanks to the typical heavy Petromax quality, the heat is distributed evenly, from the center to the edges. Heated up, the skillets hold the high temperature also when placing the meat inside. Sizzling is the best start for a perfect result and the typical barbecue flavour. The Grill Fire Skillets are available in two sizes and versions: Classic with long pan handle and small one or with two small handles. They are available as of now. For all friends of the special grilling flavour, the cast-iron Petromax skillets are now available as Grill Fire Skillets with ridged pan surface, expanding the Petromax skillet portfolio of cast-iron skillets with plane surface and cast-iron skillets for the open fire. The Petromax Grill Fire Skillets will quickly be an essential for professional and hobby cooks when preparing meat, fish and vegetables, thanks to the excellent material properties of cast iron with its perfect heat distribution. In addition, the ridged pan surface allows for low-fat roasting and provides for a defined grilling pattern. Cast iron provides further advantages. With time and each use, the iron develops a unique patina which protects the surface, prevents sticking and provides for the special flavour that fans love. 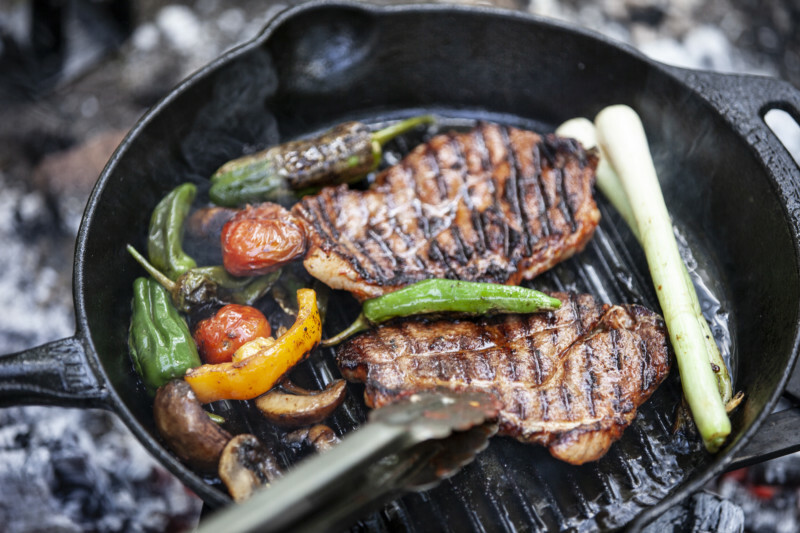 The surface of the robust and durable Petromax Grill Fire Skillets has a seasoned finish as all cast-iron Petromax products and, thus, is ready for immediate use at the campfire. The Grill Fire Skillet is suitable for use outdoors on a campfire and grill as well as at home on any stove type or in the oven. The Grill Fire Skillets are available in two sizes and two versions – with a long pan handle and a small one or with two small handles. Each version has its advantages. The Petromax Grill Fire Skillet gp30h with two small handles is perfectly suited for the baking oven or kettle grill, whereas the versions with long pan handle and short one are suited for roasting and grilling over the open fire. To effectively remove roast residues, we recommend the Petromax Scraper with Ridges for cast iron. The teeth of the scraper perfectly match the ridged structure and remove all residues in a single swipe. Rinsed with clear water and dried, the Petromax Grill Fire Skillets are quickly ready for the next barbecue adventure.